In 2014-2015, the IwB started the Connecting Divided Places project, which looked at the social, economic, environmental, and cultural divisions in Chicago, Eastpointe (MI), and Toronto. Connecting Divided Places was the second year of a five-year research trajectory set by the IwB to explore Regional Ecologies, an approach that emphasizes the study of the networks that tie together cities and regions. The IwB students, staff, and faculty travelled to each city and worked with local stakeholders, including municipal officials, community leaders, and other students from local educational institutions. Working with these stakeholders, the IwB students developed product and systems designs and conceptual tools for issues of division facing these cities. The students emphasized the need to further theorize the concept of division. They proposed that ‘Connecting Divided Places’ is contingent on understanding how division can limit access to opportunity. The students’ findings will be summarized in a forthcoming “Atlas” publication. The goals of the Connecting Divided Places project were to locate and generate new connections in Chicago, Eastpointe (MI), and Toronto. The students were asked to forge links that cross political, class, race, economic, communication, and environmental divisions in these cities by stimulating new relationships, economies, and knowledge networks. Division is the interplay between Power, Access, and Boundary that can limit access to opportunity. Chicago is a city deeply divided physically, racially, and economically. Eastpointe, a small municipality at the edge of Detroit, contains the well-known 8 Mile Road that divides the inner city from the suburbs. Toronto is a city where rapid gentrification is threatening social cohesion. 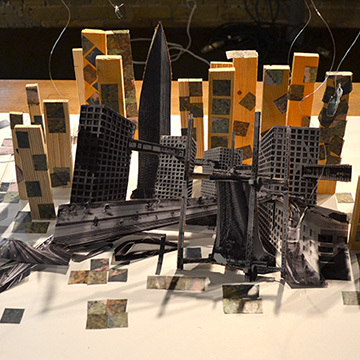 In the fall of 2014, the IwB students broadly explored the concept of ‘division,’ examining the regions of Toronto, Detroit, and Chicago. The students set out to understand how division occurring in nature, politics, economics, culture, and technology affect life in these cities. They began by theorizing the concept of division and demonstrating their theoretical propositions by looking at real issues in each of the cities they were studying. With this definition, they set out to explore the patterns, trends, and relationships that exist between people in Toronto, Eastpointe, and Chicago that limit access to opportunity. 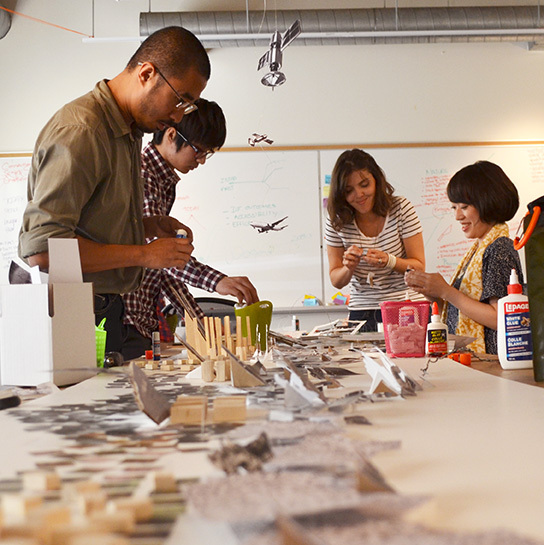 Throughout 2014-2015, the students proposed design projects that aimed to build connections between citizens, aiming to inspire community leaders and designers in Toronto, Eastpointe, and Chicago to create the conditions for equal access to opportunity. These strategies included: creating new social infrastructure to connect open space networks and activate community participation and engagement; building cultural connections, knowledge and learning networks using new technologies, applications, and organizational structures; pioneering and innovating systems of transportation that connect disparate city infrastructure; producing new economies in city-regions that can provide new job opportunities and ameliorate wealth disparity; and exploring strategies and opportunities for new social relationships and community interaction. Between their course work, the students led and participated in three international charrettes, several workshops, exhibitions and special events and projects. To find out more, see the project highlights below. And stay tuned for the release of the students’ Atlas publication! During Orientation Week, the IwB students were given the task of creating a ‘Timeline of Division.’ The students choose to make a 15-foot model that traced the major developments and shifts in human communication, transportation, and building systems. By showing the emergence of new technology and social organization, the students were able to showcase how division is an intricate part of social development. Gazebo Confessional transformed the St. James Park gazebo into a type of ‘interactive confessional.’ Here visitors could read, write, and contribute their stories of Toronto. The exhibit played with the idea of self-reflection as a means of connection and community-building. The project was the result of a collaboration with Exhibit Change, a local Toronto organization dedicated to design-driven community engagement. In October 2014, the IwB students and staff travelled to Detroit to conduct a charrette with the City of Eastpointe (MI), exploring Eastpointe’s future growth and regional connectedness. One of the biggest challenges for Eastpointe’s city government is to make better use of the resources that already exist in the community. 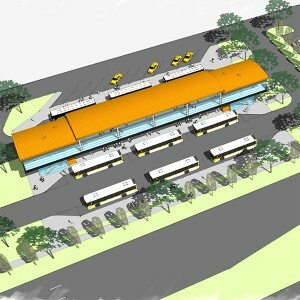 Towards this goal, the theme of ‘the commons’ was chosen for the charrette. To find out more about the charrette and view the teams’ proposals see the Eastpointe Charrette page. For their Systems & Services Module, the students made a proposal for a future autonomous transit system called SHIFT supersystem. The students started with the base assumption that in a few years time the autonomous vehicle will enter the general market and it will radically influence not only the transportation system, but a multitude of other systems. The project used trend research and analysis to provide detailed user scenarios and environmental predictions in order to depict the ways in which autonomous vehicles will actually work in the future. The SHIFT supersystem proposed by the students goes beyond the interaction between passengers cars and roads, to include forecasts of how artificial intelligence will communicate with the user and regulate traffic. The students predict that by 2050 the autonomous vehicle system will become a hyper-integrated communication network. More about this project in the students’ forthcoming Atlas! For their Communication Module, the students worked on better connecting Torontonians to the electoral process. The students proposed the “IM project,” a communication campaign that addresses issues of identity in Canadian municipal politics. It focuses on promoting the presence and engagement of immigrants and permanent residents in the electoral process. The IM campaign empowers permanent residents and newcomers by promoting their presence as contributing members of Toronto. The proposal has many features, including the IM App, a means for creating personal connections and providing access to information about politics for new Canadians. In their Environment Module, the students made a proposal for “Opportunity Hub,” an inclusive space designed to bring people together through creative social and recreational use of underutilized land at the corner of Gratiot and 8 Mile in Eastpointe, MI. The hub provides flexible space and programming for a range of activities, including retail, recreational, social and cultural, with the intention of building a new identity for Eastpointe as a gateway to Macomb County. The students envisioned the Opportunity Hub as a space to harness ‘social mobility.’ A place that could help eliminate the gap that currently exists for students in the Detroit region, between graduating high school and continuing on to a college. 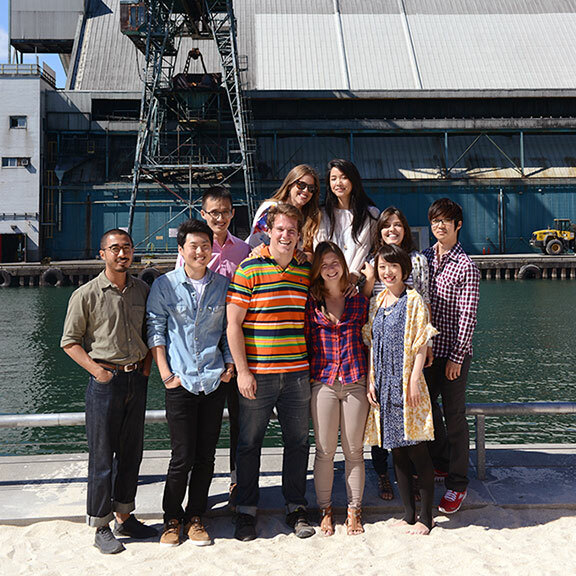 In February 2015, the IwB students participated in the Toronto Design Offsite Festival 2015 (TO DO). 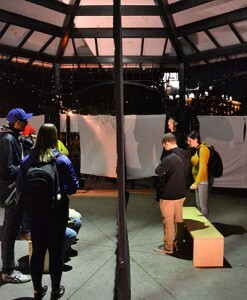 The festival is an annual city-wide exhibit of independent design in Toronto, showcasing prototypes, installations, and unique programming. The IwB exhibit for TO DO 2015 was called “The Imperative Divide,” which drew attention to the causes, outcomes and necessities of divides that enable societies to exist. The exhibition was showcased in the School of Design Gallery at 230 Richmond St. East. It was shortlisted as the “Best of Design Week” by Designlines. To find out more see our TO DO Festival page. Future Fragments introduced the students to storytelling and forecasting. Baerten, Rossi, and Tassinari challenged the students to design four different worlds. Students then explored, discussed and detailed these worlds, asking themselves what kinds of people live there? What are the values of these societies? And how do its citizens live their daily lives? Based on this exploration the students then designed artifacts for these ‘new futures.’ They presented them in a ‘wunderkamer’ or cabinet of future fragments, made up of a wall of boxes that displayed the artifacts. Through this process, the students learned about an old exhibition technique and products and services forecasting. Each year the IwB runs an international charrette bringing together local and international design students and design professionals. 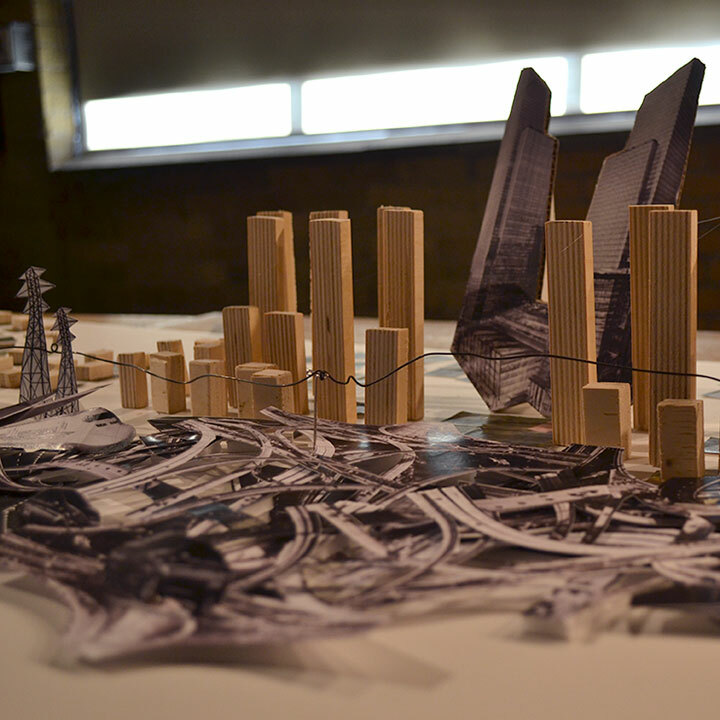 The 2015 international charrette,”Our City within a Park: Designing social infrastructure for Toronto’s urban ravines,” broadly looked at Toronto’s urban ravines, asking: How can we design new social infrastructure to connect the City of Toronto through its urban ravine system? The charrette was highly successful. The teams’ project proposals were synthesized and turned into a toolkit and a video document called “RavineLine.” RavineLine aims to influence municipal officials and community leaders and provide them with strategies to connect and engage the different neighbourhoods along Toronto’s ravines. It is a forthcoming document that broadly proposes the creation of one integrated path from the many ravines in Toronto. To find out more about the event and to view the charrette teams’ design proposals see the Our City within a Park project page. The IwB has been working with the City of Chicago since 2013. In April 2015, the IwB students and staff travelled to Chicago to conduct a 5-day charrette called “Resilient Routes,” looking at the divisions in Chicago’s neighbourhoods, principally in Pilsen and Little Village. Charrette teams were asked to think about how the city’s common spaces and public routes could be used to improve neighbourhood resiliency. To find out more about the charrette and the teams’ design proposals see the Resilient Routes project page. In June 2015, the IwB students created an exhibition called “Access Granted” that summarized the objectives and results of the Connecting Divided Places Project. The exhibit included excerpts from the students’ research in the field, their project work, their theoretical insights as well as several interactive games the students made that played with the concept of division. Access Granted was presented at the ARUP office in Toronto. The Exhibition was a great opportunity for IwB students to showcase their work through the ARUP network and gain valuable industry feedback. The exhibit was later moved to the School of Design Gallery. Feedback from the exhibition will be incorporated in the students’ forthcoming Atlas publication.